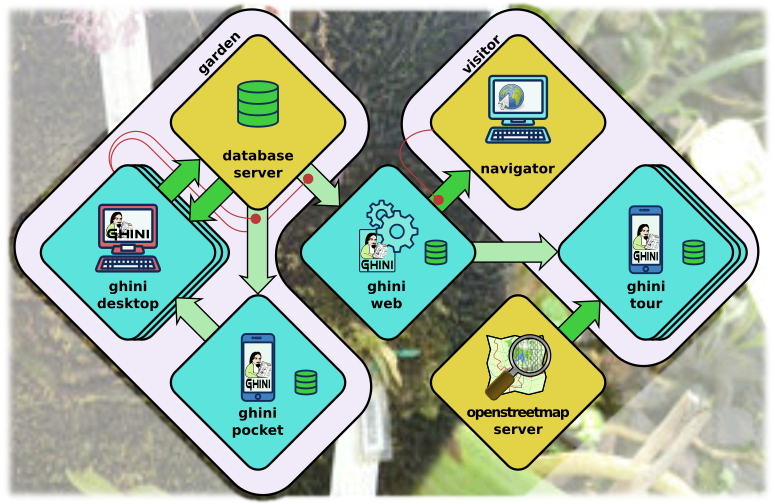 Ghini is a suite of applications for managing botanical specimen collections. ghini.desktop lets you create and query a database representing objects and events in your plant collection. ghini.web publishes highlights from your database on the web. ghini.pocket puts a snapshot of your database in your handheld device. ghini.tour assists garden visitors with a map and spoken virtual panels. The bulk of this documentation focuses on ghini.desktop. One final chapter presents the rest of the Ghini family: ghini.pocket, ghini.web, ghini.tour, and the data streams between software components. All Ghini software is open and free. Our standalone software is released under the GNU Public License. Our client-server software follows the GNU Affero Public License. Do you want to join Ghini? If you’re using Ghini, or if you feel like helping its development anyway, please consider donating.